We can get pretty brutal winters out here in New Jersey. That’s why it’s so important as a homeowner to make sure certain aspects of your home are ready to go before the freezing cold weather hits. 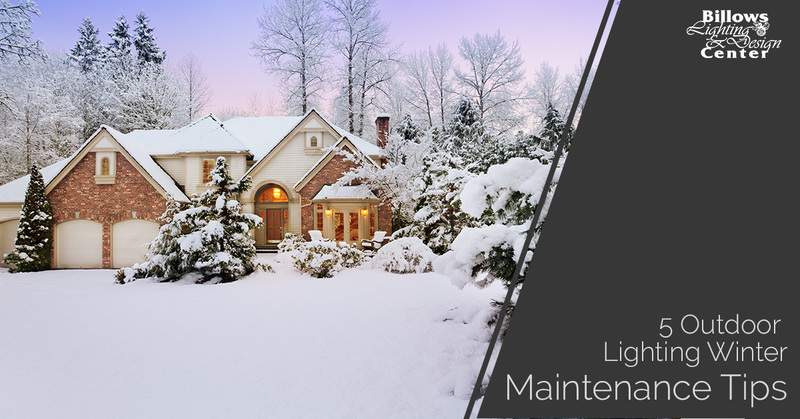 From your roof to your outdoor lighting, there are certain maintenance tasks you need to complete before the wintertime is in full swing. In today’s blog post, we’ll go over five winter maintenance tips you should practice to prepare your home’s outdoor lighting fixtures for the winter. At Billows Lighting & Design Center, our family-owned-and-operated business offers one of the largest selections of lighting products and services in Berlin, and we provide items from some of the best lighting manufacturers and brands in the nation. Whether you’re upgrading your current outdoor lighting or are starting completely from scratch, we know we’ll have something in our lighting showroom that you’ll absolutely fall in love with. Schedule an appointment with one of our experienced and knowledgeable lighting specialists today for assistance with your home’s outdoor lighting. Continue reading below for our five outdoor lighting winter maintenance tips. 1. Inspect your home for any exposed wiring. For your safety and the safety of those who reside in your home, take the time to inspect the outside perimeter of your home for any exposed wires. If you find some wires popping out, call a landscape lighting professional. These professionals can then rebury the wires before the ground around your home freezes. 2. Clean the glass lenses of your light fixtures. It’s amazing how much dirt, dust and debris your outdoor light fixtures can collect. Take a cloth and some glass cleaning solution and scrub down the glass lenses of your outdoor lights. We guarantee you’ll immediately notice an illuminating difference! 3. Adjust your light fixtures (if necessary). Inclement weather conditions, especially wind, can move around your outdoor landscaping lights. Re-adjust these as necessary to ensure they’re illuminating the areas you want them to. 4. Check and replace any light bulbs. Extremely cold weather can drastically shorten the lifespan of your light bulbs. If you notice any dimmed or completely shot light bulbs, replace these before it gets too cold outside. 5. Look for any moisture-related issues. Cold weather conditions such as ice and snow are known to cause system outlet issues. If this happens to you, simply click the “Reset” button on the outlet. If that doesn’t do the trick, call for the assistance of a landscape lighting professional. Do not attempt to make any repairs yourself, especially if you are unfamiliar with electrical systems. While you’re out checking the status of your current light fixtures, you might find that you’re in the market for some new outdoor light fixtures for your Berlin home. If this is the case, we encourage you to stop by our lighting showroom and shop our outdoor lighting selection at Billows Lighting & Design Center. We have everything from landscaping lights to exterior wall sconces, and our lighting experts can connect you with ideal lighting solutions that match your budget and your home’s design style. For more information about our lighting products and services, feel free to contact our lighting staff by calling (856) 281-1399 or by completing our online form. Have a great upcoming holiday season!